CANNA TERRA nutrients have been developed to give excellent results with every type of potting mix. 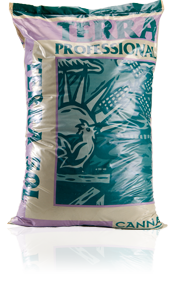 To make the most of the TERRA nutrients, CANNA has developed a high quality potting mix: CANNA Terra Professional. CANNA Terra Vega is a complete professional nutrient for the growing phase of plants. It is specially developed for growing in pots and potting mix. CANNA Terra Flores is a complete professional nutrient for the flowering phase of plants. It is specially developed for growing in pots and potting mix. Terra Flores stimulates the fruition and provides every plant with its characteristic flavour. CANNA Terra Professional is a nitrogen-rich potting mix for plant cultivation. CANNA Terra Professional potting mix is unlike anything you will find in a garden centre. 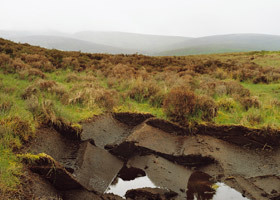 It contains a blend of upgraded black peat, granulated peat moss and perlite. If you are going to grow indoors or outdoors, this is the potting mix you want to use. To ensure good root development the feeding water must be between 20 - 25°C. When it's below 15°C the roots’ capacity to absorb decreases quickly, which results in a smaller harvest. If the feeding solution is mixed using cold water then the pH will rise when the water is heated. In this case, a high pH can be avoided by setting the pH a bit lower from the start. Want to know more about CANNA TERRA? In this Infopaper we explain everything you want to know about growing plants in potting mix. Growing in potting mix is generally the easiest way to grow.